It is appropriate, in accordance with Directive 92/65/EEC, to lay down, by way of derogation from the general rules on animal movements in Chapter II of that Directive, special animal health requirements for the movement of circus animals. The measures provided for in this Regulation should apply to travelling exhibitions, fairs or animal acts but not permanent establishments referred to in Article 2(1)(c) of Directive 92/65/EEC. For animal health purposes, it is necessary for the competent authorities to have certain information on circuses and fairs which contain circus animals, in particular as regards movements between Member States. It is therefore appropriate to require that such circuses and fairs be registered in a Member State and that their itineraries be recorded. Circuses and fairs often perform outside their Member State of origin. It should therefore be possible for them to be registered in the Member State in which they are ordinarily resident or in which they are situated, even if that is not their Member State of origin. An animal act contains a single animal or a limited number of animals kept for the primary purpose of public exhibition or entertainment, and may be independently managed or owned. Animal acts may perform outside their Member State of origin, for example when forming part of a circus or when carrying out work on an individual basis such as activities for entertainment or filming. It is therefore also appropriate to include animal acts within the scope of this Regulation. The animal health risk posed by a circus or fair is directly related to the species of animals kept in it. 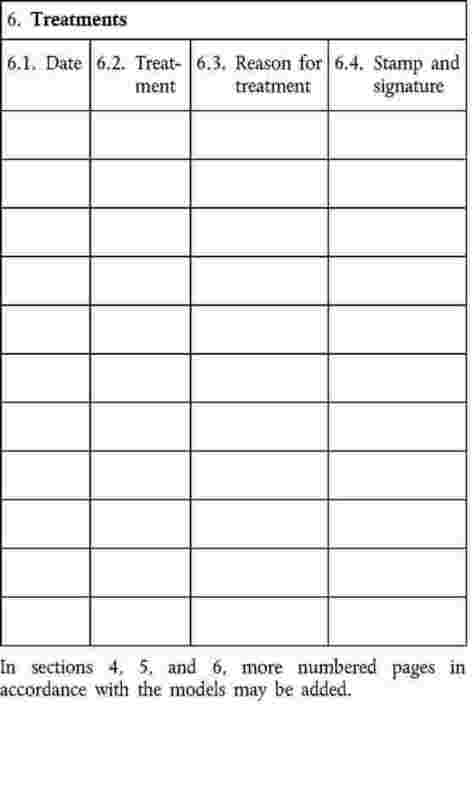 Operators of circuses and of animal acts should therefore be required to keep registers recording the relevant information about the presence of their animals. It is necessary to facilitate controls on the animal health status of circus animals. 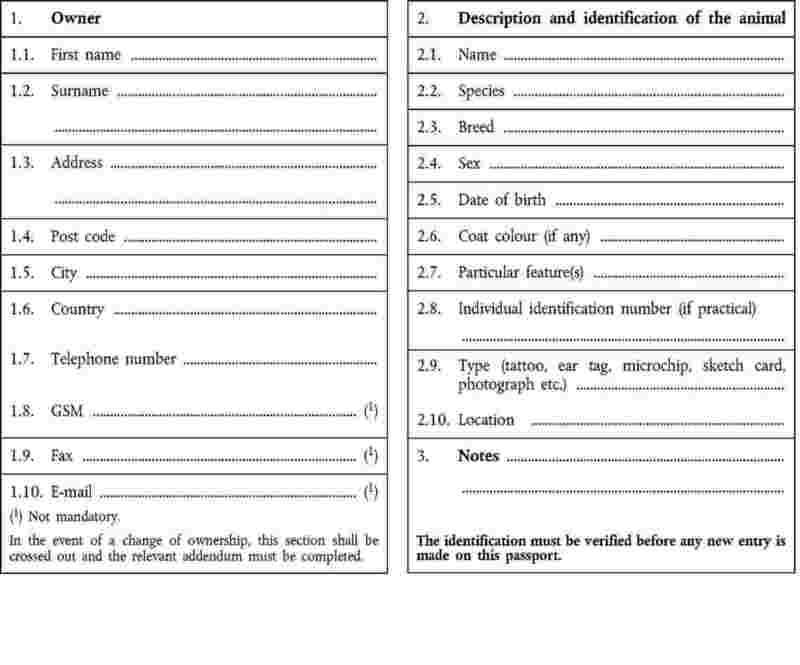 Taking into account the different ways in which circus animals are moved within the Community, it is appropriate to provide for passports for circus animals which should record all the relevant animal health information, including details of official testing and vaccinations. The animal health rules for circus animals can be based on the same principles as the Community animal health legislation concerning intra-Community trade in domestic animals kept in holdings, including Council Directive 64/432/EEC of 26 June 1964 on animal health problems affecting intra-Community trade in bovine animals and swine (2) and Council Directive 91/68/EEC of 28 January 1991 on animal health conditions governing intra-Community trade in ovine and caprine animals (3). 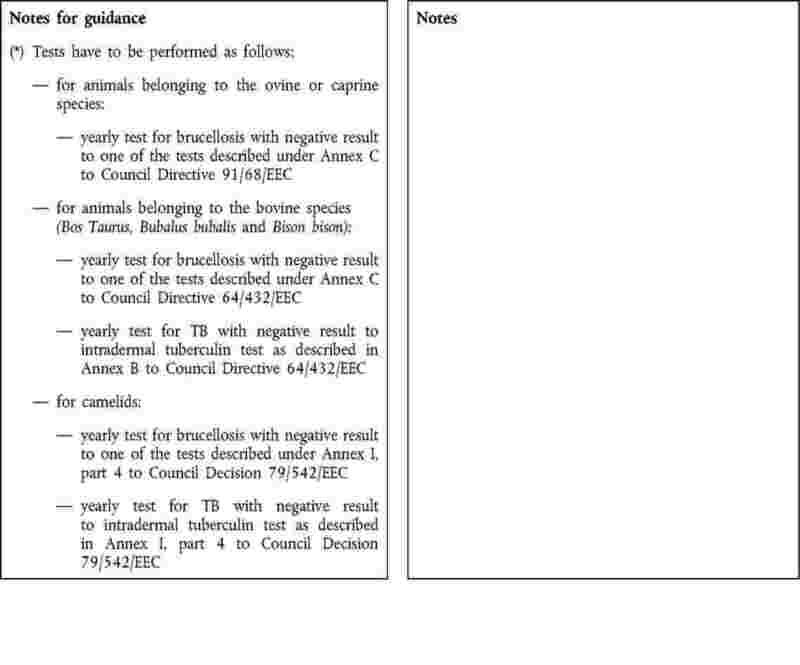 However, these rules should be adapted to the particular problems posed by the relevant animal species when they are kept in circuses and fairs and properly attested by an official veterinarian as defined in Article 2(7) of Council Directive 90/425/EEC (4). Animal health conditions and accompanying documentation or passports have been laid down for the intra-Community movement of cats, dogs and ferrets in Regulation (EC) No 998/2003 of the European Parliament and of the Council (5) and of equidae in Commission Decision 93/623/EEC (6). Circus animals of those species should therefore comply with the rules on passports and animal health laid down therein. In the interests of consistency, it is appropriate to permit Ireland, Cyprus, Malta, and the United Kingdom to apply to circus animals which are susceptible to rabies their national rules on quarantine as provided for in Directive 92/65/EEC. The measures provided for in this Regulation should be without prejudice to legislation implementing Council Regulation (EC) No 338/97 of 9 December 1996 on the protection of species of wild fauna and flora by regulating trade therein (7). 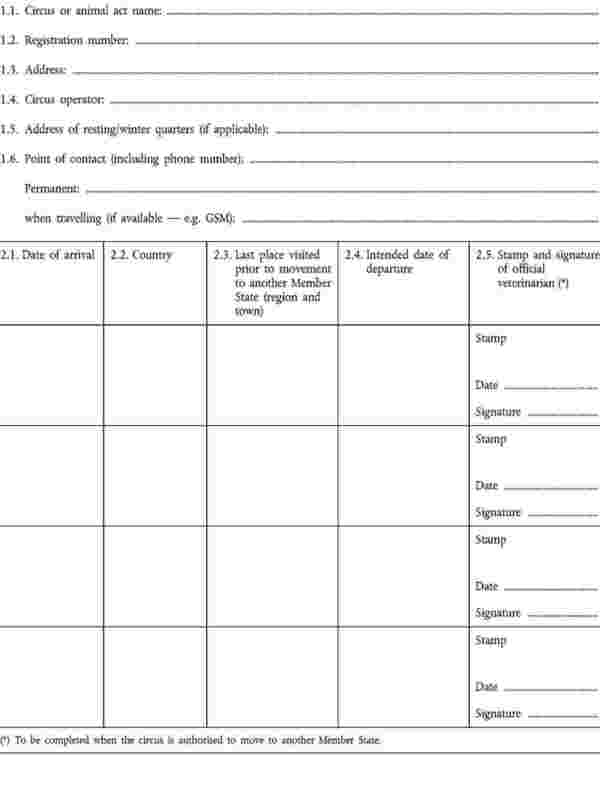 To ensure full traceability of circus animals, it is necessary to record intra-Community movements of circus animals using the Traces system introduced by Commission Decision 2004/292/EC (8), and to apply the certification requirements for intra-Community trade as laid down in Commission Regulation (EC) No 599/2004 of 30 March 2004 concerning the adoption of a harmonised model certificate and inspection report linked to intra-Community trade in animals and products of animal origin (9). Sufficient time should be allowed to permit the implementation of the new requirements provided for in this Regulation. By way of derogation from Chapter II of Directive 92/65/EEC, this Regulation lays down the animal health requirements applicable to the movement of circus animals between Member States. The rules on circuses apply mutatis mutandis to animal acts. the relevant rules on certification contained within legislation implementing Regulation (EC) No 338/97 on the protection of species of wild fauna and flora by regulating trade therein. ‘official veterinarian’ means the official veterinarian as defined in Article 2(7) of Directive 90/425/EEC. A circus may move to another Member State only if it is registered in accordance with Article 4 and if Articles 8, 9 and 10 are complied with. 1. 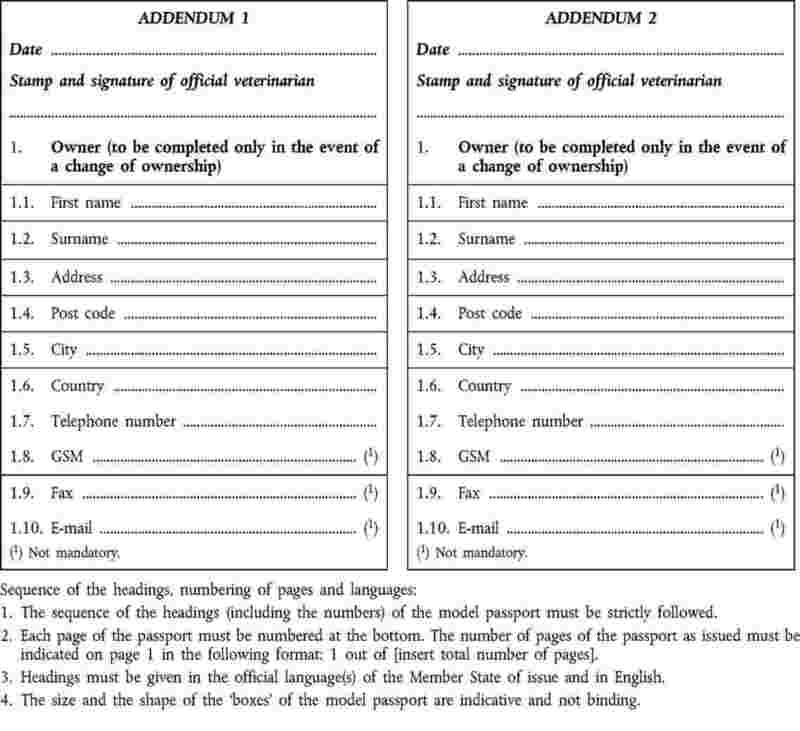 At least 40 working days before a circus first moves to another Member State, the circus operator shall submit in writing an application for registration to the competent authority of the Member State in which the circus has its legal residence or in the Member State in which it is situated. 2. Following receipt of the application referred to in paragraph 1, the competent authority shall carry out all the necessary checks on compliance with the animal health requirements laid down in this Regulation. 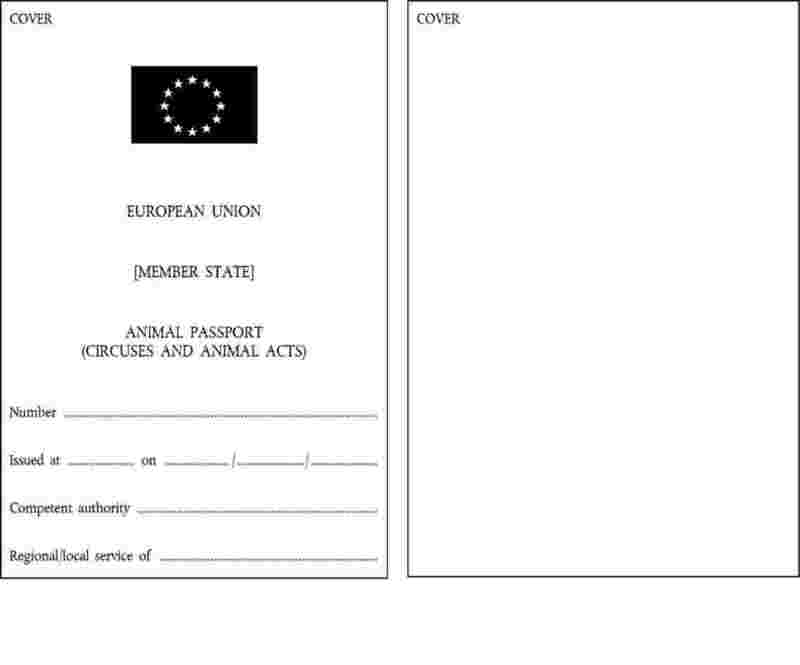 animal passports in accordance with Article 7. 4. The competent authority shall keep a record of all the documents issued by it under paragraph 3. 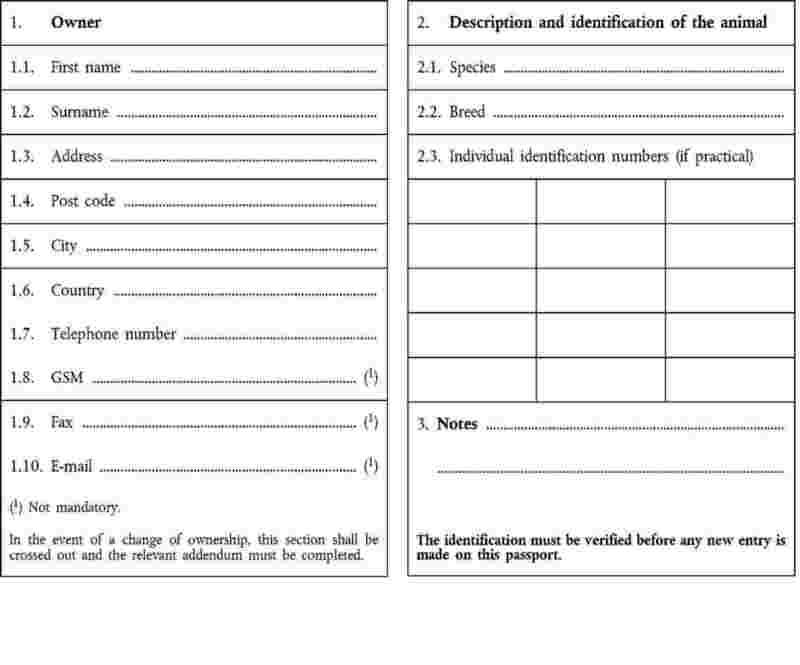 The register of animals in the circus referred to in Article 4(3)(b) shall be in conformity with the model laid down in Annex I and bear the registration number referred to in Article 4(3)(a). Each page shall be stamped and signed by the official veterinarian prior to issue. The venue register referred to in Article 4(3)(c) shall be in conformity with the model laid down in Annex II and bear the registration number referred to in Article 4(3)(a). 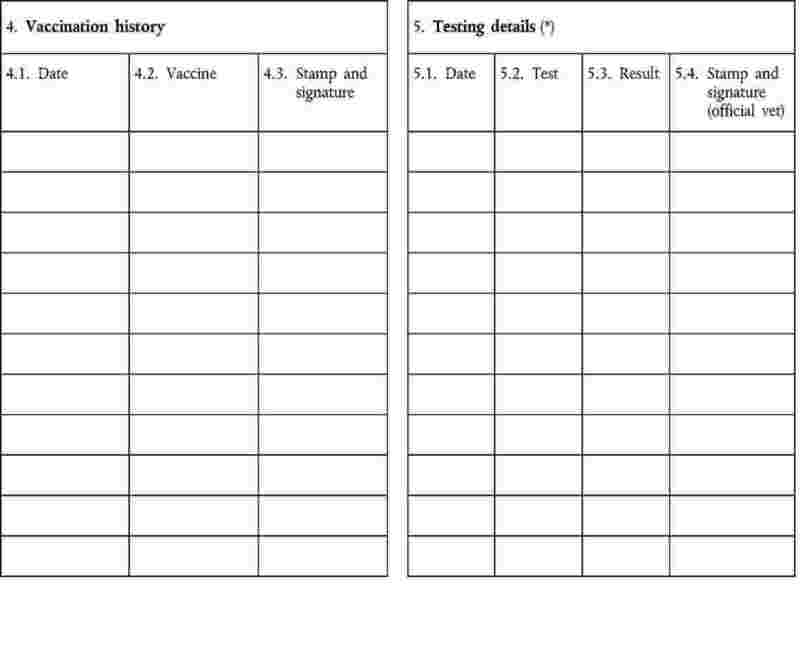 Each entry shall be stamped and signed by the official veterinarian prior to each movement referred to in Article 9. 1. In accordance with Article 4 the competent authority shall issue for each animal in the circus, other than those referred to in paragraphs 2, 3 and 4 of this Article, a passport in conformity with the model laid down in Annex III. 2. In accordance with Article 4 the competent authority shall issue for birds and rodents in the circus a collective passport in conformity with the model laid down in Annex IV. 3. Dogs, cats and ferrets in the circus shall be subject to the passport and animal health rules in Regulation (EC) No 998/2003. 4. Equidae in the circus shall be subject to the passport and animal health rules in Decision 93/623/EEC. at least 10 working days before departure, the competent authority in the Member State in which the circus is situated is informed of its intention to move to another Member State. 2. The circus operator shall ensure that each animal in the circus is kept in a way that prevents direct or indirect contact with any animal not registered under this Regulation. 3. The circus operator shall ensure that all information in the registers referred to in Articles 4(3)(b) and (c) is kept for at least five years. verify that the passports of the animals in the circus are up to date. 2. If all the conditions set out in paragraph 1 are met, the official veterinarian shall indicate that the circus is authorised to move within the next 10 working days by signing and stamping the last column of the venue register referred to in Article 4(3)(c). 1. The circus operator shall, at least 48 hours before the circus moves from one Member State to another, communicate the relevant information to complete the intra-Community trade certificate in Traces to the competent authority of the Member State of departure. 2. The competent authority of the Member State of departure shall, using the Traces system, notify the movement to the competent authority of the Member State of destination and to the competent authority of any Member State of transit. 3. In the intra-Community trade certificate model as laid down in Regulation (EC) No 599/2004, the species and passport number of the animals in the circus shall be inserted in point I.31 on the identification of animals/products and the present Regulation shall be mentioned in part II. (1) OJ L 268, 14.9.1992, p. 54. Directive as last amended by Directive 2004/68/EC (OJ L 139, 30.4.2004, p. 320); corrected version in (OJ L 226, 25.6.2004, p. 128). (2) OJ 121, 29.7.1964, p. 1977/64. Directive as last amended by Regulation (EC) No 1/2005 (OJ L 3, 5.1.2005, p. 1). (3) OJ L 46, 19.2.1991, p. 19. Directive as last amended by Commission Decision 2004/554/EC (OJ L 248, 22.7.2004 p. 1). (4) OJ L 224, 18.8.90, p. 29. Directive as last amended by Directive 2002/33/EC of the European Parliament and of the Council (OJ L 315, 19.11.2002, p. 14). (5) OJ L 146, 13.6.2003, p. 1. Regulation as last amended by Commission Regulation (EC) No 1193/2005 (OJ L 194, 26.7.2005 p. 4). (6) OJ L 298, 3.12.1993, p. 45. Decision as amended by Decision 2000/68/EC (OJ L 23, 28.1.2000, p. 72). (7) OJ L 61, 3.3.1997, p. 1. Regulation as last amended by Commission Regulation (EC) No 1332/2005 (OJ L 215, 19.8.2005, p. 1). (8) OJ L 94, 31.3.2004, p. 63. Decision as last amended by Decision 2005/515/EC (OJ L 187, 19.7.2005, p. 29). (9) OJ L 94, 31.3.2004, p. 44. 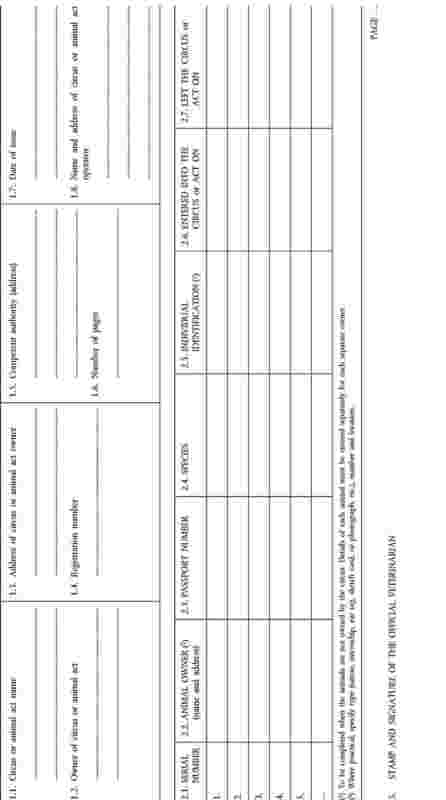 (1) The register must be in the form of a book, the pages are proof against substitution. To this end each page shall be signed and stamped by an official veterinarian prior to being issued to the circus operator. It must be kept for a minimum of five years.